It is the year 2022. 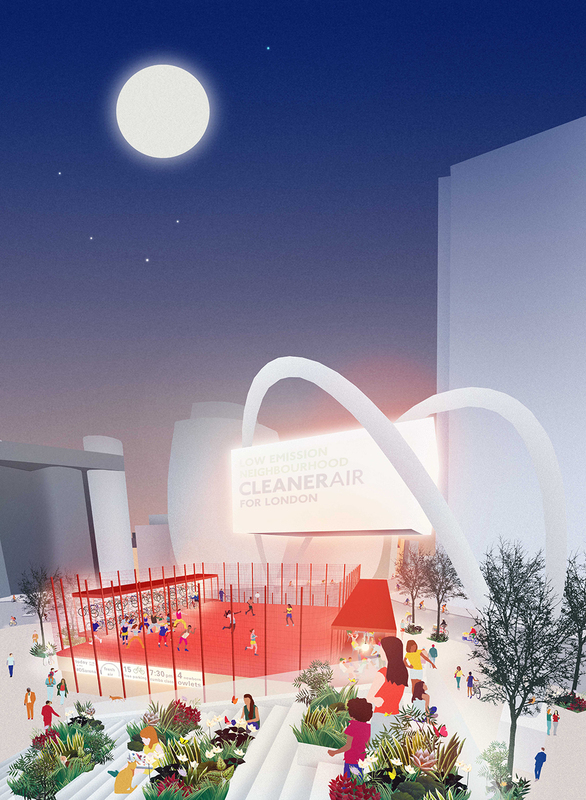 Old Street’s air is no longer toxic! Met by a sigh of relieve from silicon roundabout’s communities London’s ultra low emission zone was extended to the North Circular and more people than ever choose to cycle. Old Street roundabout, previously a space to be avoided and dangerous for pedestrians and cyclists, has been transformed into an arena for public life. Thanks to the new Old Street station roof that doubles up as raked seating with intermittent planting you can now enjoy dramatic views of the new Old Street Arena – a striking new venue for sports and cultural events at the heart of what used to be the roundabout. Making clever use of the clerestory roof below the iconic advertising arch of Old Street, a transformable space was recently created. Wrapping around this elevated platform, a light elegant structure accommodates secure bike parking, changing facilities and spaces for socialising or work. From the café the hustle and bustle of Old Street can be watched or turning towards the central platform a Feldenkreist class, basketball match, photo shoot or art performance in action. Equipped with the right facilities the Old Street arena provides ample space where diverse activities can unfold bringing together local communities with the working crowd and visitors of Shoreditch. Detailed information about the program can be found via the Old Street app and for those without digital access, external monitors are displaying the activities and events together with information about bike parking availability, air pollution levels and local information such as the outcomes of the latest ‘Shoreditch Town Hall’ against ‘Charles Square and Pitfield TA’ netball match. A softer, more colourful and accommodating public realm has emerged at Old Street station thanks to the many new trees and lush pockets of wilderness that were introduced. The intense urban environment at Old Street has now become a popular hangout for young and old, a welcome breathing space en route to the station that emphasises natural qualities and seasonal change. The trees and plants are key ingredients of the scheme to improve the air, living quality and travel experience in this central London location. Large and small planting areas were constructed to absorb and store the run off water from the surrounding pavements and to support local biodiversity. 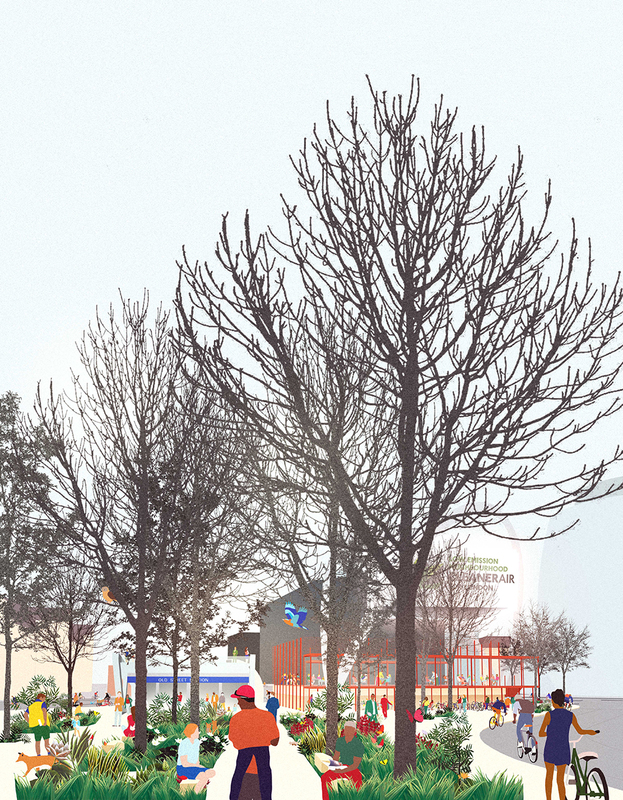 New trees that complement the existing majestic plane trees along Old Street together with the surrounding green have been adopted by local businesses, shop owners and residents groups. This is part of a management strategy that seeks to involve local communities hands-on and long-term.